Last year, I was invited to a wedding in Thailand, which was an amazing experience. I was schooled quite vigorously on the various etiquette and customs, with my mother-in-law repeatedly telling me to wear lots of gold jewellery. I didn’t really have any gold jewellery so, for reasons that made perfect sense at the time, I decided to make some. Armed with about £25 worth of materials, this YouTube video, and the back cover of this book, I set about making the above earrings, bracelet and necklace. The chain on the necklace and bracelet is not what I originally envisioned – I was looking for something a little more delicate and I went through a lot of patterns before finding one that actually worked with the sizes of jump rings that I had. Lesson learned from this experience: find out what size rings are needed *before* you buy them. 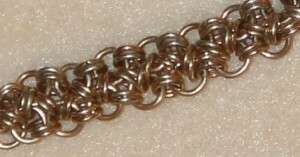 Despite it being my first attempt at making chain maille, I was pretty pleased with how it worked out. 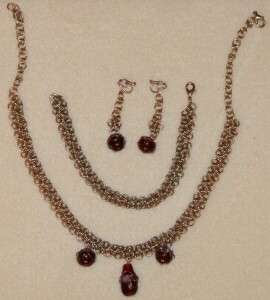 All the pieces survived the wedding and have been worn on numerous occasions since without falling apart. 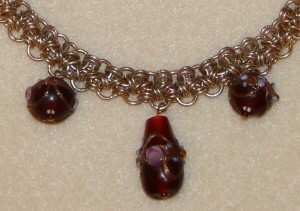 Close up of necklace. 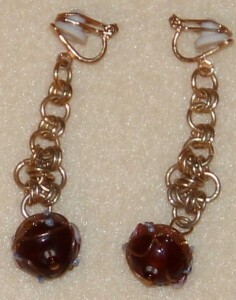 I am loving the Venetian glass beads!